Empathy is a stimulated emotional state that relies on the ability to perceive, understand, and care about the experiences or perspectives of another person or animal. Empathy is a powerful emotion that drives our connection with those around us. It is a capacity that most humans are born with, is developed over time, and reinforced through our interactions with the world. Empathy is also an important driver for positive social change and motivates people to take caring action towards animals and nature. Here at Woodland Park Zoo, we believe that fostering empathy with animals is a powerful tool for empowering our guests and the community to make conservation a priority in their lives. In 2015, Point Defiance Zoo and Aquarium, Seattle Aquarium and Woodland Park Zoo embarked on a journey together to intentionally improve our capacity to foster empathy for animals and evaluate the outcomes of our efforts. At the time, very few evaluative tools were available to assess whether programs in informal learning institutions are achieving the desired outcome. The three organizations collaborated on the Measuring Empathy: the Collaborative Assessment Project (MECAP) to design tools that can be used by staff to gain insight into the effectiveness of their programs. We continue our research-based approach to understand empathy and how it applies in zoos and aquariums. We invite you to join us on this journey – learn about and participate in our programs! 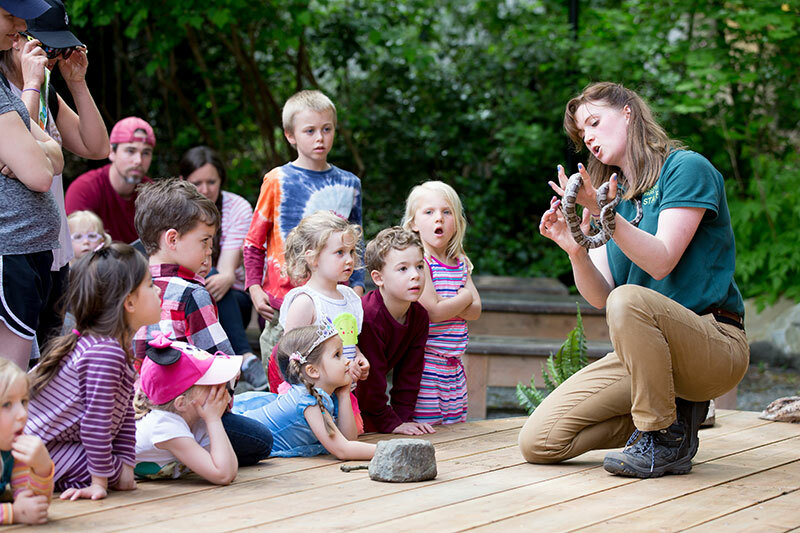 Here at Woodland Park Zoo, we incorporate our new understanding of empathy into our programs with training for our educators, summer camp instructors, animal keepers and volunteers to provide them with effective ways to engage in guests’ empathetic skill development. Our educators and animal care staff teamed up to create two new programs using the zoo's ambassador animals. These programs help highlight the individual animals’ stories while encouraging more understanding of how these animals’ needs and experiences are both similar and different from our own. As part of the Empathy Project, Woodland Park Zoo will specifically be examining the intersections of animal welfare and perceptions of animal welfare, as well as how this relates to empathy. Zoos and aquariums have an ethical commitment to prioritizing animal welfare. While we provide experiences that can greatly enhance a guest’s emotional connection with animals, it is important to understand their thoughts on the care we provide and how their perceptions affect this connection. The Empathy Project will examine this topic and make recommendations to help organizations prioritize both animal welfare and a positive empathetic experience for guests during their visit.